Legwarmers, that fashion staple of would-be Flashdancers and '80s aerobics classes, are making a comeback. During Fashion Week in New York in February 2010, more than one designer featured models sporting slouchy legwarmers. Legwarmers are an easy project for anyone with basic knitting skills. Wear them over tights or skinny jeans, with boots or heels. Knit two, purl two across. Repeat every row to form ribbing. Continue in the ribbing pattern until piece measures 18 inches or desired length. Bind off all stitches. Cut thread, leaving an 18 inch tail. Thread the tail of yarn onto the darning needle. Fold the leg warmer so that the right sides are together and the raw edges match. Use a whip stitch to sew the edges together, take one stitch every 1/4 inch. Turn your leg warmer right side out. Make a second leg warmer to match. Use a self-striping yarn for stripes, or choose a solid color. 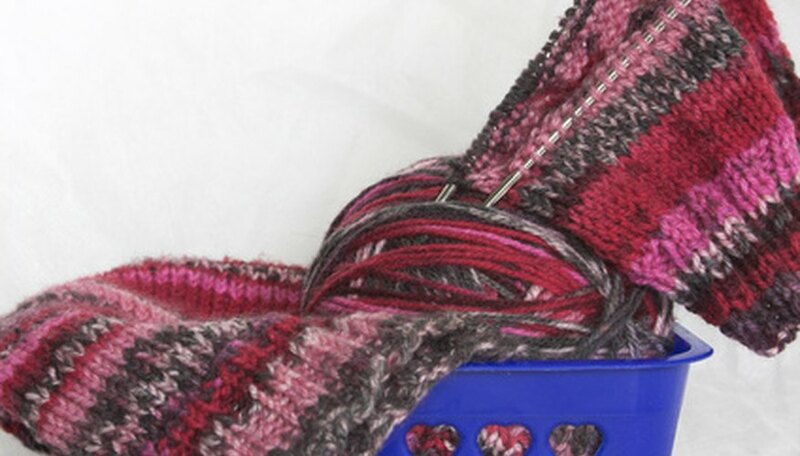 Look for yarn that contains elastic for better fitting leg warmers. If your leg warmers sag, sew a narrow band of elastic inside the top.